When it arrived I'm not exactly sure when. The Kaka hurt in some unknown instance. Boy, can he squawk ! With the odd low flying blow. One she wont quickly forget. And will endeavour never to be late with his breakfast again. That in a suburban street. A kaka would find a welcome retreat. Taken up residence in Kiwi's backyard. Well maybe for a while anyway. Pretty much doing as he pleases. Made himself at home in the surrounding trees. Standing up to the dog with relative ease. Or be forever claiming insurance. By dismantling the rubbers on her car no less. However he is a taxing guest. Putting Kiwi's patience to the test. Makes her laugh with his antics. And coming closer with each passing day. Its based on facts and tidbits she's told me about her unlikely friend. 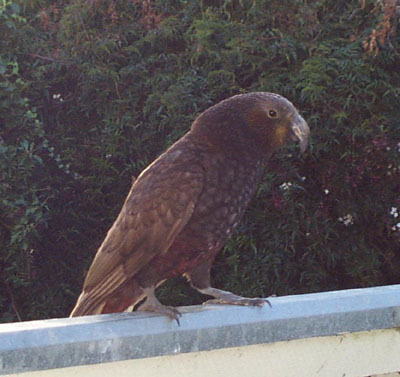 In case you were wondering the Kaka is a native parrot to New Zealand. One of our many endangered species of birds. And they're not usually found in Feilding *s*.